Above is a set of doors that with the other side (not shown here) span about 9 M. or 30 ft. They are about 3M high. They are inside the main lounge area of a social club. In the normal course of events they are pushed close to each side giving free passage from one area to the other. As you can see they hang from a track installed from a beam just below the ceiling and there are no floor guides. From time to time various events like wedding receptions and birthday parties are held in one area and the concertina doors are drawn across for privacy. Here's a close up view of the other end. I guess that the main section of each panel is a stiff material, maybe plywood that is about 400mm wide by about 14 or 16mm thick, 16" x 3/4" roughly. The whole set is covered in this heavy curtain like material and it is this material that forms the hinge. To the best of my knowledge they are at least 15 years old and they are still doing their job. I guess that this door or screen would be probably about as big as this type of door goes, and I have seen them in houses where the opening is not much more than a metre and the slats are say 100mm, 4" wide. Thinking about the names here, concertina and accordion doors, these musical instruments work on a folding bellows system which is probably as old as metalworking. 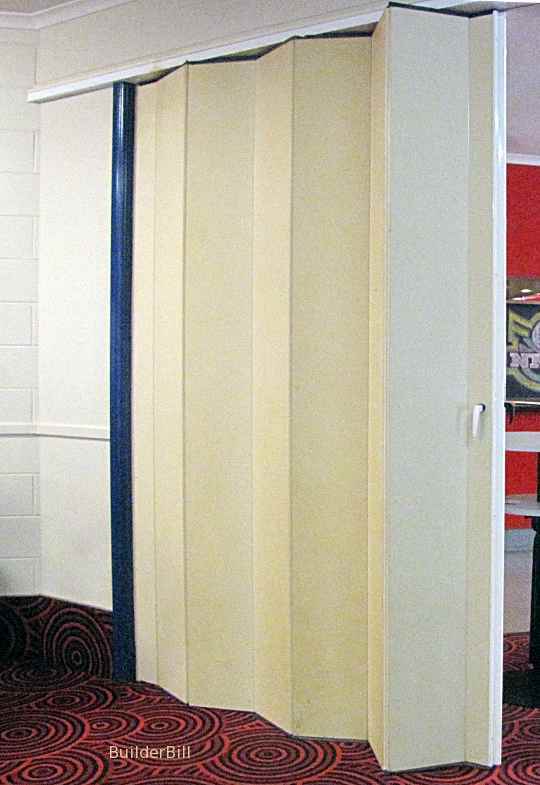 So I wonder who the first guy was that had that spark of brilliance to apply the system to doors or room dividers?